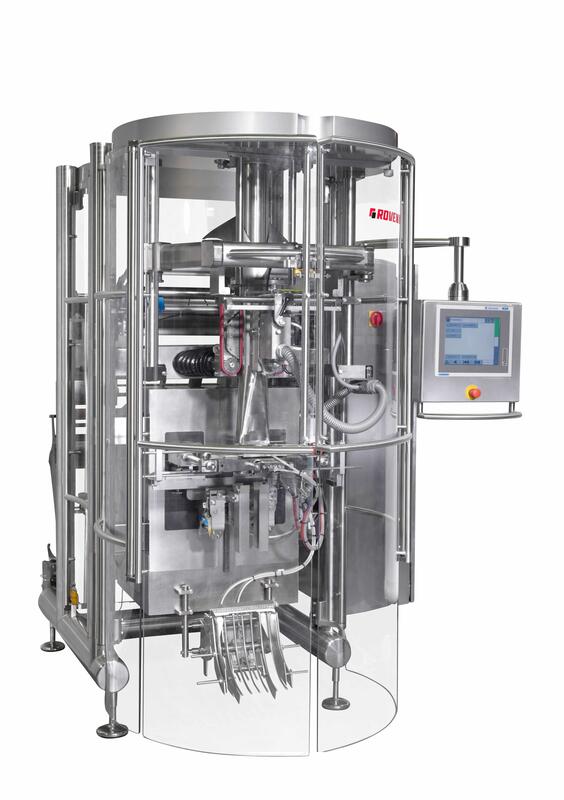 There are numerous reasons why someone may consider a vertical packaging machine for their coffee packaging needs. Your business may be expanding and you need to look at an option that saves on labor and packaging costs while handling the increasing demand. You may have aging equipment that is unreliable and causes excessive downtime. You may be transferring from pre-made, hand-filled bags to automated packaging looking for increased output of packaged product. You may be searching for a packaging system that has a small footprint. Before making the decision on a vertical bagger for your coffee product there are some key points that need to be researched and considered. The ability to package your product immediately after roasting is an important aspect of maintaining product freshness. Preventing oxygen degradation is the way to keep your coffee tasting fresh and delicious. This is accomplished through methods, such as Aroma Perm or Modified Atmospheric Packaging, that lower your residual oxygen levels. Minimum recommended oxygen levels are no more than 3%, however industry standards are typically set at 2% or less. Because the end goal is ultimately a great product that provides consumer satisfaction, a vertical packaging machine that offers low residual oxygen levels is a high priority for coffee packaging. This tiny object that goes on your flexible packaging plays a pretty big role. They prevent inflation of your package by allowing gasses to escape. Something that could otherwise lead to a bag that bursts open. They keep the dreaded oxygen from getting into the bag once it is sealed. They speed up the transition from roasting to packaging by improving the WIP (Work in Process) inventory. Degassing valves perform all of these functions with a feature that allows gases to be released and at the same time, prevents oxygen from getting in. While this is typically not used on frac packs, there is a surface mounted valve that can be applied at higher speeds which is gaining more momentum with this packaging type. A VFFS machine needs the capabilities to incorporate this application into their line while still running the desired speeds and creating a high-quality bag. It goes without saying that you would be looking for a machine(s) that can keep up with the demand for your product. You want to make sure you are investing in a vertical bagger that can do more than match your current production needs. It should also match your future growth expectations. The package that houses your product represents your brand and the value you place on your product. With bag styles such as the quad seal (Rovema refers to this as Stabilo) bag, vertical form, fill, seal machines are able to produce sturdy, high quality bags that successfully represent the image you are trying to convey. The pillow bag or stand up pouch needs to have gas tight, strong seals that protect your coffee product. It should be evenly formed and consistent in size. An offset seal provides alignment with the corners of the bag allowing a crisp, clean look with the quad seal. You want a machine that can make an aesthetically appealing package with seal integrity, clean knife cut, and will let you know if a produced bag does not meet those requirements. A machine that performs well, with quality parts and features is not only what is hoped for in a VFFS, but it should be expected. After all, achieving optimal OEE (Overall Equipment Efficiency) is the desired outcome for machine operations. Decreasing downtime inefficiencies saves valued labor time and costs. A properly designed machine, with electrical and mechanical quality components, can help with film savings and energy consumption as well as labor costs. Overall, it will reduce direct costs and operational stress. Support you receive after the installation is necessary in order to be truly satisfied with your VFFS. Getting quick and knowledgeable responses on your questions or issues prevents downtime from becoming an issue. And knowing you have that support for the life cycle of the machine is peace of mind. As parts age and need replacement, a team that can quickly assist you is as important for OEE as the quality of the machine. Price of the machine varies depending on what you want regarding performance. If your goal is high speed packaging, flexibility in packaging styles and a machine built with a sturdy and expert design, then it may be more expensive than a machine that is geared toward one packaging design with lower speeds. The complexity needed of the machine correlates to the cost. 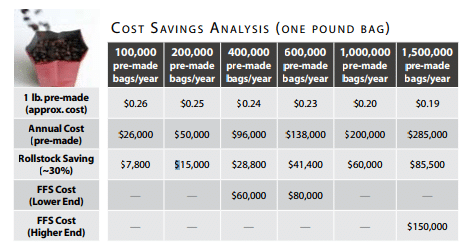 For example, a machine that makes a variety of packaging styles or formats may be more expensive than one that is producing one bag format. A VFFS is an important part of your coffee packaging operations. You will want to feel comfortable and confident in the machine and manufacturer you choose. After all, you will have that machine for years to come. Looking at the key elements described can clarify and help make that choice easier.